A rainy Pollinator Day. Photo by Debbie Roos. Apiary Inspector Supervisor Don Hopkins does a beekeeping demo inside the bee cage. Photo by Debbie Roos. Kids learned about bees and butterflies and did fun crafts. Photo by Debbie Roos. 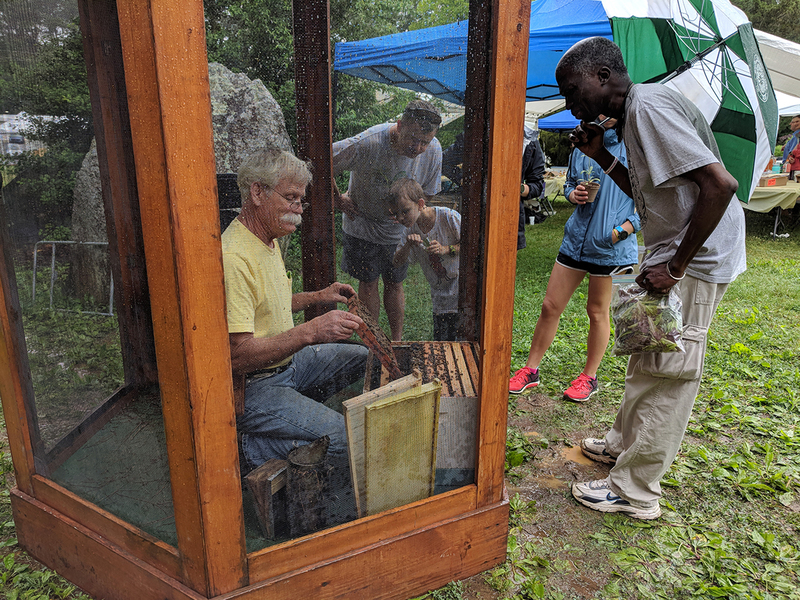 The Chatham County Center of North Carolina Cooperative Extension and the Chatham County Beekeepers’ Association teamed up to hold their 11th Annual Pollinator Day Celebration on Saturday, May 19, from 9:00 a.m. til 1:00 p.m. on The Lawn at Chatham Mills in Pittsboro, NC. The event was co-sponsored by Starrlight Mead. The purpose of Pollinator Day is to raise public awareness of the importance of the bees and other pollinators that are needed to produce 80 percent of our flowering plants and one-third of our human food crops. 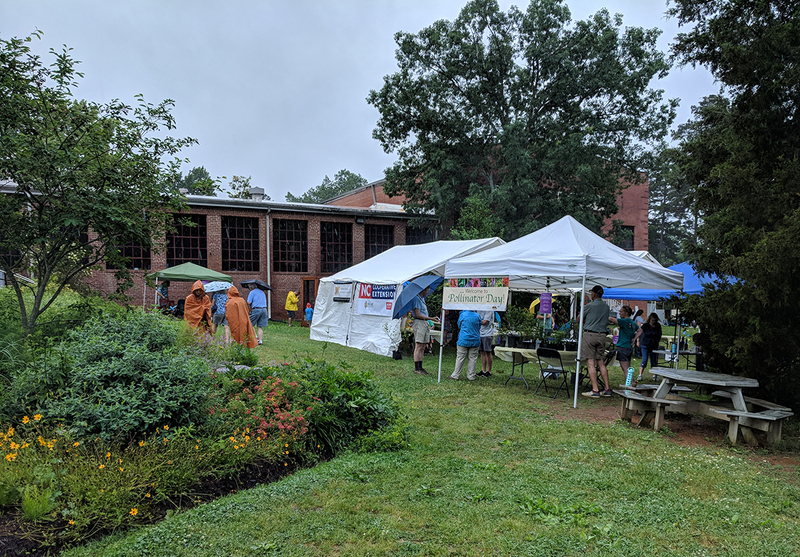 Visitors enjoyed educational programs, toured the pollinator garden, observed beekeeping demonstrations, sampled honey and foods cooked with honey, and learned about beekeeping, native bees, mead making, and much more. 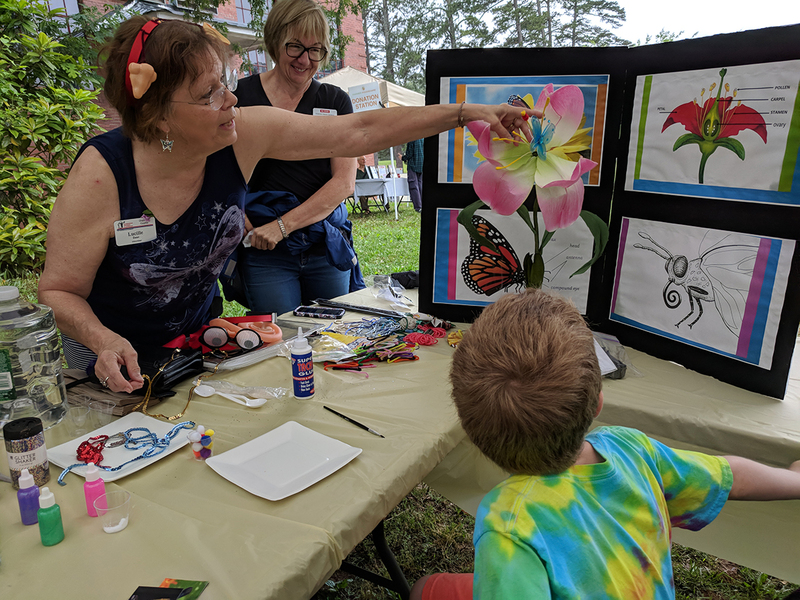 Kids’ activities included face painting, balloons, plant-a-pollinator plant, and butterfly crafts. Even though it rained during most of the event folks still turned out and had a great time!